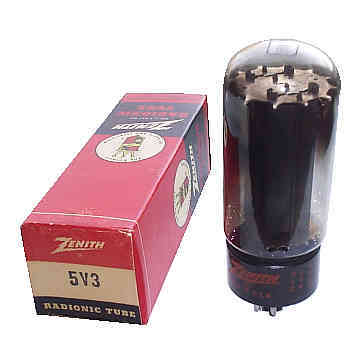 This is a genuine, vintage Zenith 5V3 Radionic Full-Wave Rectifier electron tube in it's original box. The 5V3 was developed for use as a power supply in color television receiver, amplifiers and other electronic equipments requiring high dc voltage. Excellent for replacement, antique radio, instrument, TV television restoration projects, experimentation, circuit research or to set up a private vacuum tube museum.